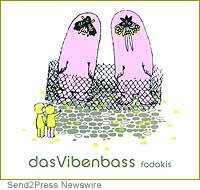 SEATTLE, Wash. — Hop Productions proudly announces the release of Fodakis, the new album by Das Vibenbass on Tuesday, June 19th, 2007. The Seattle quartet that is, “crushing the borders of Jazz,” presents Fodakis – a collection of songs that consciously challenge cultural assumptions about the jazz medium. From Los Angeles to Berlin, audiences have been captivated by the music of Das Vibenbass. Sustaining a spot in the top five of Seattle’s KEXP 90.3 jazz charts for over 5 months, the quartet was then nominated for Best Jazz/Experimental act in the Seattle Weekly poll, “Best of 2006.” Tours of the United States, Germany, Austria, and the Czech Republic have cultivated a devoted fan base spanning many ages, many countries, and many tastes.